Viren Batra, a nature lover and globetrotter, wanted to fulfill his entrepreneurial dream by starting his own business. 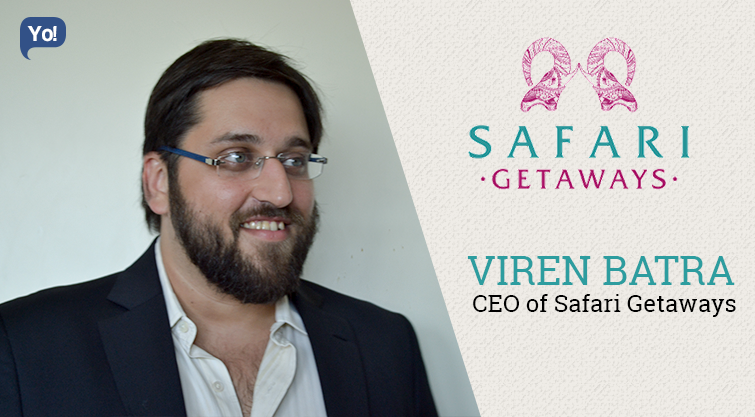 Being very fond of traveling, Viren stepped out from the comforts of his family business and went on to start his own business in the travel and tourism industry. Born into a business family and having educated himself in business, starting his own endeavor became easy. His experience along with his passion enabled Viren to conceptualize Safari Getaways, which provides personalized high-end luxury safari experiences. Safari Getaway’s provides personalized high-end luxury safari experiences. My love for nature is something that has proved to be my biggest inspiration in creating Safari Getaways. My service allows people to get up close and see the greatness of nature without having to compromise on comfort. My life’s mantra is very simple. Eat, Drink, Travel the world and live your life to the fullest. Work hard so you can live well, don’t make work your life. After working in the Exports Industry for 10 years I decided to take the leap and follow my passion. I love travel industry, but when I first entered it, I had no prior experience and knowledge. Leaving the safety net of the family business and starting off on my own in a completely new industry is the biggest challenge that I faced. My education and the fact that I grew up in a business family, gave me the tools to deal with these challenges. Running a business was not new to me and this helped me get started much quicker. The industry knowledge came and is still coming through my own experiences. This has, in turn, become our USP that we do not operate like any other travel agency and thus the experience that our clients get by working with us is incomparable, which brings them back to us again and again. So far we have been running a self-funded company. We are in a business, which generates real revenues. However, we have plans to look for investment down the line as we come closer to bringing our growth plans to fruition. To be honest, we have not faced this issue. As the owner, I am heavily involved in the day to day running of the company and all the operations. I also believe in keeping my team motivated by giving them the independence to deal with challenges on their own. I am always around to advise, guide and if needed step in to help, but I avoid hand holding. The culture of our organization is very homely. We prefer not to work under the traditional hierarchy system and believe in open communication between members. Being a start up all of us realize that we have to pitch in everywhere and I have been lucky to put together a team which is willing to pull together and make this endeavor a huge success. Fostering a feeling of ownership and belonging in the team is what has helped me deal with the problem of Brain Drain. 1 – I believe for a person to succeed you need to be prepared to fail. The saying ‘Try and try until you succeed’ is very very valid. 2 – Success may not always come overnight so you should be ready to put in the hard work over a long period of time. 3 – A successful person is someone who is thirsty for knowledge. Always be open to learn new things. The Google Suite of business apps such as Drive, Docs, Sheets etc is something I like using extensively. It allows the team to be on the same page and lets me connect to work from anywhere. This is something I would highly recommend. Focusing on one job at a time helps me to be productive. On very high-stress days I take 5 minutes to make a to-do list which helps me focus my actions. I have seen that by tackling one item on this list at a time makes my work go very smoothly. The one habit that I would like to change in myself would be my tendency to procrastinate. It is very easy sometimes to lose yourself while doing research on exotic destinations and uber luxury camps. My passion for this industry sometimes tends to blur the line of practicality which is something I need to correct myself. One very important tip to follow in order to succeed is that you must listen very carefully to your customer. You might think you have the best product or amazing service but eventually, it is your customer who is the end user. By listening closely to them and modifying your approach to making your product/service end-user friendly, you can ensure that your business will be a big success. Over the next 3 years we plan to open our very own Uber Luxury Camps in India or abroad. I have loved every bit of my journey so far. However, if I had to change something, it would be to bring in someone with industry experience early on. This would have probably helped me learn my basics faster. The 3 destinations I love going to are Kenya, Vietnam, and Bali. All these countries are easy to go to since they have visa on arrival. With a combination of stunning natural beauty, lovely people, great food, fantastic stay options and a relaxed ambiance makes me want to visit again and again.